Are you getting ready to start baby led weaning? This Baby Led Weaning Gear Guide will help you find BLW gear for introducing solids with real food! As soon as I finished reading Baby-Led Weaning: The Essential Guide to Introducing Solid Foods-and Helping Your Baby to Grow Up a Happy and Confident Eater by Tracey Murkett and Gill Rapley, I was ready to gather together helpful baby led weaning supplies. The only true baby led weaning must-haves are a baby, your lap, and some food! But this Baby Led Weaning Gear Guide can help your baby start solids with a little less mess and a little more style. Below are checklists of baby led weaning equipment for: (1) use at home, and (2) eating out. Wipes for cleaning up after the meal. The best way to learn about BLW is to read Baby-Led Weaning: The Essential Guide to Introducing Solid Foods by Gill Rapley and Tracy Murkett. I love the baby-led weaning method of introducing solid foods, but I don't agree with some of the recommendations for first foods. Our family eats a Paleo and Weston A. Price inspired diet, so we try to opt for nutrient dense foods. Our baby skipped toast and gnawed on Kalbi ribs instead! You can get some inspiration as to nutrient dense foods to feed your baby by reading Nourished Beginnings Baby Food by Renee Kohley. Just skip the section on purees. In order to join in the meal, your baby should be safely seated upright. Picnics are a wonderful option for baby led weaning. 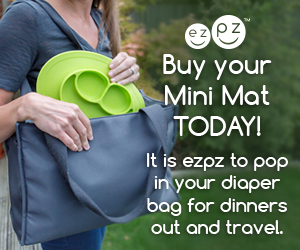 Your baby can sit directly on the picnic blanket, which can also serve as the splash mat for catching dropped food. If you cannot make it outside for a picnic, you can always have one on your living room floor! When eating at a table, your baby can either sit on your lap or sit in a high chair or booster seat. The important part is that your baby is included at the table during the family meal. When choosing a high chair, think about how easy it is to clean, as BLW is a messy affair! The most often recommended highchair for BLW is the Ikea Antilop Highchair, since it is relatively inexpensive and easy to wipe clean. If we were staying in one house for a long time, I would have opted for a natural wooden high chair, such as the Stokke Tripp Trapp Bundle or the Keekaroo Height Right Highchair with Insert & Tray . But since we are always on the move, we decided that something compact and inexpensive made more sense. We opted for the Fisher-Price Healthy Care Deluxe Booster . One advantage is that we can take it along when visiting friends or relatives or to restaurants. The deluxe version adjusts to three height levels and comes with a main tray, a removable dining tray, and a cover to attach when transporting the booster seat. If you decide to use a booster seat at home, it is a good idea to pair it with a chair cover , to protect your dining room chair from spills. If you don't mind investing in more than one seat, you could use a larger high chair at home and a small booster seat when eating out. The next most important item after a high chair is something to catch the crumbs that fall to the floor. And when I say "catch the crumbs" I really mean "catch the entire meal" when starting baby led weaning. You can protect the floor under Baby's chair with a splat mat or drop cloth, or even a table cloth. The important aspect is that the material is easy to clean after each meal. If you keep the splat mat nice and clean, dropped pieces of food can be re-offered (but use your best judgment!). Minimize the mess by choosing bibs with catch pockets or "crumb catchers". I love the OXO Tot roll up bibs for use at home and while eating out. Long-sleeve bibs are also a good option for protecting clothes. When Baby joins you at the table, it is nice to provide Baby with his own place setting, so he can become accustomed to using the same items that we use when dining. When it comes to plates and bowls, you can use regular dishes from the family set. Heavy plates are less likely to be dropped or thrown across the room than lightweight plastic kids plates. If you choose to get Baby his own special bowl or plate, white colored Corelle dishes are a great non-toxic option. You could also opt for a tempered glass bowl or stainless steel platter. Providing utensils (cutlery) allows Baby the chance to practice using these tools. I liked to place an OXO Tot spoon or fork on my son's tray, and allow him to figure out how to use them by imitating us. We got the Oneida set for our daughter and love the mini spoon and fork. It is quite impressive what children learn, just by copying others. For a cup, I suggest going straight to an open top cup for use at home. There will definitely be more spills at first than with a sippy cup, but your baby will also learn how to use a cup faster. I want my baby to be a little physicist, learning about the laws of gravity, rather than thinking that when you turn a cup upside down the liquid stays in the cup. The Doidy Cup is especially designed for babies learning to use an open cup. We bought a set of shot glasses that look like regular water glasses and are a perfect size for our baby to pick up in his little hands. ezpz recently released a silicone Tiny Cup, which is the perfect size for baby hands. Stock up on washcloths for cleaning Baby's face and hands and wiping down the high chair after a meal. When our baby loses interest in the meal, we remove the tray, wipe his face and arms once with a soft wash cloth, take off his bib, and whisk him away to the bathroom for a more thorough face and hand washing. If your baby will be sitting on your lap during meal times, an apron will help protect your own clothing. Some helpful items for preparing your baby's first foods include: a vegetable steamer; a crinkle cutter to cut fruits and vegetables into easy-to-hold zig zag sticks; a grape cutter; and Popsicle (ice lolly) molds for making frozen treats. If you know you will be eating out, but are not sure if there will be a suitable high chair available for your baby, you may want to bring along a travel high chair or booster seat. The Chicco Pocket Snack Booster Seat is one of the most popular options. The Pocket Snack sits on top of a chair and adjusts to three heights. It folds up compactly for easy transportation. Update March 7, 2015: We have been using the Chicco Pocket Snack Booster Seat while traveling abroad and we love it! It folds up compactly so it is easy to carry along. It is a nice small size for young babies, but can also be used without the tray for older toddlers. Update January 25, 2017: Now at three-years-old, my son is still using the Chicco Pocket Snack as a booster seat, just without the tray. It has held up well over the past two years of use. Another option is a travel chair that hooks onto the table, such as the Inglesina Fast Table Chair with Dining Tray. However, these hook-on chairs may not fit on all tables. My first choice for a seat to use both at home and away was the Inglesina in light blue, because it is just so darn cute! But it did not work with the skirt on our table. In order to stay organized while away from home, I recommend packing Baby's eating accessories into a wet/dry bag or small cooler bag. When you get home you can wash the reusable items and restock the bag, just the way you would a diaper bag. I like this method, since it keeps me prepared and separates my baby's eating gear from his cloth diapers. A place mat is helpful for eating out, especially if you are not bringing along a booster seat with a tray. You never know how clean the table is! Instead of a placement, you could bring along a stainless steel baby bowl with lid. That way you can take home leftovers. For times when you are away from home, it is nice to have a cup with a lid. We opted for an insulated stainless steel cup with a straw, which is leakproof when the lid is closed, minimizing spills while transporting the cup. I started brining along snacks for my baby when he began BLW at six-months-old. He didn't need to eat snacks between meals, but I wanted to have an option with us in case the meal we chose was not suitable for him. For the most part, we offer bits of whatever meal we are eating, but there are some times when I am not sure of the ingredients and do not feel comfortable sharing with him. My baby is adamant about joining in the meal, and it just would not do to eat in front of him without having something to offer him. The stainless steel container also doubles as a rattle to keep him occupied. Two Lifefactory 1-cup containers should fit in the SoYoung Small Cooler Bag. Update August 11, 2017: We have been using our set of U Konserve stainless steel containers for three years now, and they still work great. I use the two smaller ones for packing snacks and the larger one for storing homemade tooth powder. A small wet/dry bag is perfect for storing your baby's basic eating essentials. A roll-up bib, spoon, and washcloth fit nicely in the outer dry pocket of the Planet Wise Travel Wet/Dry bag. After a meal, the items that are covered in food can be moved to the inner waterproof pocket. Wash or wipe clean when you return home, and everything can be reused! I like to bring a toddler sized spoon or fork for eating out. My son doesn't actually eat with utensils yet, but a spoon entertains him before or after a meal. The Planet Wise Travel Wet/Dry bag is the perfect size for packing a bib, spoon, and wash cloth. If you get two of the OXO roll up bibs, you can use one at home and one while out and about. The silicone catch pocket is easy to wipe clean, so they can be used many time before needing to be laundered. Wash cloths and gentle baby wipes are great for cleaning up Baby's face and hands and the place mat or tray after a meal. It is also helpful to bring along a small toy or coloring book, in case Baby needs something to play with until the food arrives. I also often let my baby play with his spoon while we are waiting. If your little one tends to get especially messy while eating, you may also want to pack an extra baby outfit, just in case. That wraps up our list of baby led weaning supplies. You may also want to read our post explaining the basics of baby led weaning. When do you plan to start baby led weaning?